Have complete control of your entire home at your fingertips. From sound and TV to lighting, heating, air conditioning and more, we´ll give you the control options that best suit the technology you´re comfortable with, design and budget. Using dedicated wall panels, remote controls or your own smart devices you can control as much or as little as you want to keep it user friendly with displays only showing what you need or want to see. We can provide a room by room solution or put it all together neatly and clutter free for you in a centrally located AV rack. Heating, air-conditioning, intercom, security systems, CCTV, blinds, lighting, AV – we are surrounded by products that use technology to help us in our everyday lives but quite often we can´t get these devices to work together. How often have you brought home a new product only to spend hours trying to work out how to integrate it and ending up with a system more complicated than when you started. Integration allows all of those same systems and devices to work from just one simple to use interface or remote control. When your AV system is not centralised, every room needs SKY boxes, Blu-ray players and AV receivers in each. If however, we install a centralised AV distribution system you´ll need just one set of most AV equipment. We will then distribute the signal to the rooms where you want to enjoy your home entertainment. With only a screen and sound system needed, each room in your home will remain clutter free from technology and remain looking exactly the way you designed it. A Smart Home is one that intelligently knows to turn the lights on when the sun goes down or pulls the blinds, dims the lights and fires up the surround sound simultaneously when you want to watch a movie. We work with Control4 who offer flexible cost effective solutions for single room or whole-home automation tailored to your personal preferences. For the ultimate Smart Home, the EA-5 controller has the capability to control hundreds of devices. Browse massive music libraries; distribute high resolution music and 4K video throughout the house; automate a sophisticated home theatre and manage and control thermostats, door locks, cameras, shades, garage doors, irrigation systems, security panels, interior/exterior lighting and so much more. Or start small with the starter pack for an exceptional family room with the EA-1 controller and remote control. 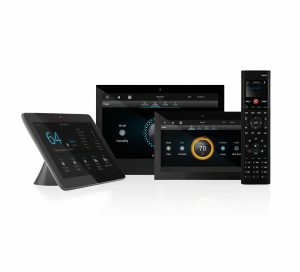 Unlike other one-room remotes, it´s not only robust enough to control entertainment devices like satellite boxes, game consoles and TVs, it also has the power to manage lights, thermostats, smart locks and more.